The first product that caused me to stop at Aldi, as a regular, not a tourist, was eggs. My local Costco stopped selling eggs in quantities less than 2 dozen. (Did I mention? Vegan?) A dozen eggs at Aldi was .69 cents, and Jacques could have fresher eggs. So a started to swing by for eggs. 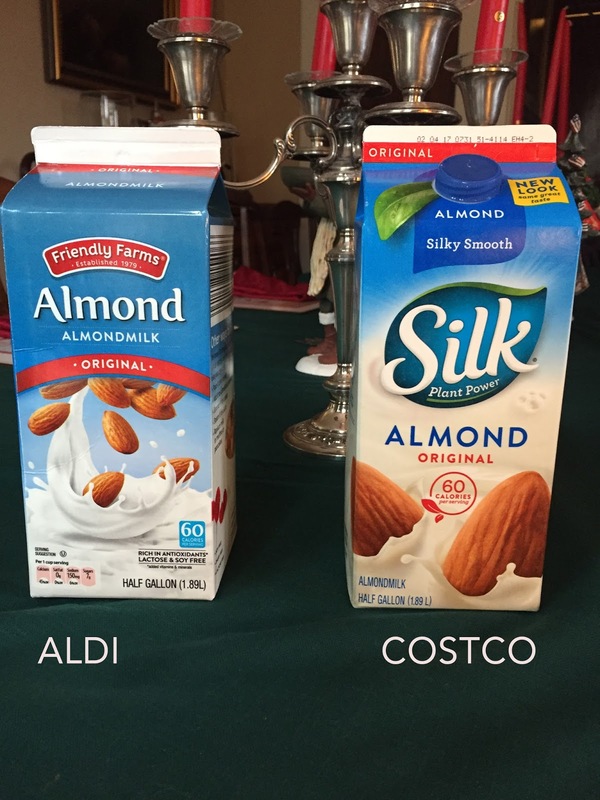 Near the eggs, Aldi sells half-gallon Friendly Farms Almond milk for $1.99. As part of the previously mentioned veganism, I'm drinking nut milk. Which, of course, I've been buying from Costco. My Costco sells Silk, three half gallons, for $7.59. I was convinced the Costco product must be better, because it cost more, but I decided to try the Aldi's as an experiment. Seemed OK, but I doubted my judgement, so I did a blind taste test on Jacques and myself. Let me just put it out there that Jacques is not a big nut milk person, but he couldn't tell the difference and neither could I. Nutritional information looked identical. 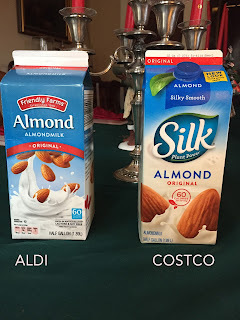 As part of my research for this column, I read a blog from 2014 that said Aldi Friendly Farms nut milk contained carrageenan, but that is not on the ingredients list of either the Friendly Farms Nut Milk or the Silk Nut Milk from Costco at this time. Aldi has been a learning curve. after about 7 visits, I found myself returning as a regular, knowing some of the regulars' behaviors, like not getting a new cart from the shopping cart rack. You hand a quarter to a finished shopper who is on her way to the rack. When you're done, you accept 25 cents from a newcomer. And remember to take your own bags inside, particularly when it's this cold.